One of the easiest ways to cause trouble with a cellphone is to have your private messages forwarded to someone else. Not every private message on your phone or tablet needs to be seen by everyone, and the odd personal message can cause you harm if it gets to the wrong hands. One method of preventing friends (or enemies) from surreptitiously forwarding private messages found on the phone is to disable the mass forwarding feature in iMessage. This can be accomplished with a Cydia tweak called ForwardDisable. 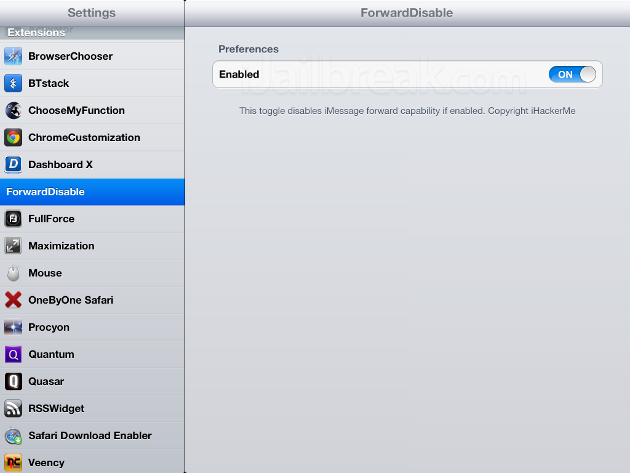 ForwardDisable is a free tweak that can be found in the BigBoss repository on Cydia. It can be toggled in settings, but will only take effect if you close iMessage from the taskbar first. While ForwardDisable does what it promises, it disables the forward function in iMessage, it won’t prevent texts from being copied, pasted, and sent one at a time. This tweak might slow down someone who’s actively trying to sabotage you, but it likely isn’t going to stop them. The iPhone is capable of copying both images and text to and from SMS messages. If you want to keep your most private messages messages secure, the better bet is to keep untrustworthy people out of you messages entirely. You can accomplish this with a simple password lock or with a more secure messaging app (such as the security-minded app, Foxygram, which includes the ability to remotely delete your sent messages). Another good solution is AppLocker, a $0.99 tweak that puts password locks on individual apps. If your primary concern is keeping your friends off your messages, you can probably get away with a 4 digit password. Since ForwardDisable does not also disable copy/paste, you’re better off finding a different tweak to secure your privacy. Do you trust your friends with your phone? Share your thoughts in the comments section below.